RIO DE JANEIRO, Sep 27 2012 (IPS) - Cíntia Rose Regis, 23, not only breastfeeds her 16-month-old daughter Zelda but has also been donating 600 ml a week of breast milk to a mothers’ milk bank in Brazil over the last year. It was her paediatrician who suggested she donate her milk. “As long as my daughter is nursing and stimulating my milk flow, I will carry on donating,” she said. And she added that if she has another baby, she will continue to donate part of her milk. 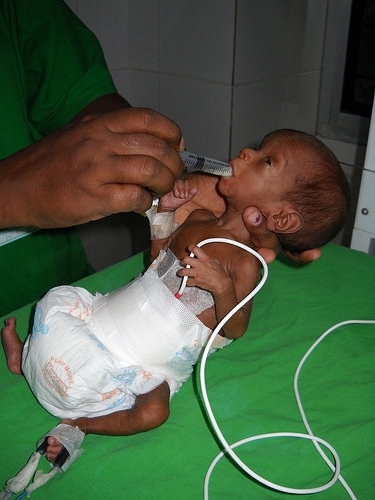 Breast milk is vital for a premature newborn weighing barely 500 grams. Any woman who produces more milk than her baby needs can donate the excess to Brazil’s national network of breast milk banks. Brazil is becoming an international reference on the matter, and exports low cost technology to set up breast milk banks to 23 countries, as an effective tool to combat infant mortality. There are 210 mothers’ milk banks distributed throughout Brazil, in every state. And the initiative has led to the creation of 28, in Spain, Portugal and several countries in Latin America and Africa. So far in 2012, 97,000 litres of breast milk have been collected from 86,000 donors in Brazil and have been used to feed 108,000 babies. Last year, 165,000 litres were donated by 166,000 mothers, helping nearly 170,000 babies. The only requirements under Brazilian law are that donors are healthy and are not taking any medication. The guidelines include simple recommendations for personal hygiene: clean, dry hands and forearms; a quiet, clean place away from animals; a sterilised container; and storage of the milk in a freezer. Breast milk donated to a bank goes through a selection, classification and pasteurisation process and is then distributed as “quality certified” to babies hospitalised in neonatal units. This country of 192 million people “has built the largest and most complex network of breast milk banks in the world,” expert João Aprígio Guerra de Almeida told IPS. “We don’t just carry out collection and distribution. We have breastfeeding support centres, quality control methods, nutritional indicators, monitoring and advisers,” said Almeida, the coordinator of the Brazilian and Ibero-American Network of Human Milk Banks. The Brazilian government has supported this effort for nearly 30 years, through research at the state Oswaldo Cruz Foundation (Fiocruz). In 1985 Fiocruz established the first Latin American centre for breast milk research with the goal of understanding the biological, physical, chemical and immunological characteristics of mother’s milk. Since the 1990s, the country has achieved a 73 percent reduction in infant mortality, and this year it met one of the Millennium Development Goals, agreed by the countries of the United Nations in 2000: a two-thirds reduction in the mortality rate of children under five, between 1990 and 2015. “Because of our work, the World Health Organisation has recognised Brazil’s impressive gains in reducing infant mortality,” Almeida said. Before the research effort, “we were completely dependent on the northern hemisphere. To process the milk we had to import equipment from Europe and the United States, which cost some 35,000 dollars at that time,” he said. International cooperation began in 2007, and now countries like Argentina, Bolivia, Ecuador, Paraguay, Venezuela and Uruguay have the infrastructure to collect and distribute donations of breast milk. “We support the establishment of these banks and provide advice and train professionals,” said Almeida. When the initiative was extended to the Ibero-American region, Portugal and Spain joined the network and benefited from an unusual South-North technology transfer. The creation of milk banks “spread internationally, and in 2007 the leaders of the Ibero-American countries decided to adopt the strategy as an inter-governmental action,” Almeida said. At the summit held that year in Santiago, the Ibero-American mothers’ milk bank programme was established. The first Spanish bank was set up in Madrid, and in Portugal the Dr. Alfredo da Costa maternity hospital in Lisbon was similarly equipped in 2008. Cape Verde became the first African country to join the network, with a milk bank that began to operate in August last year. Fiocruz delegations visited Mozambique and Angola in 2010 and 2011, respectively, and projects are under way there. Much depends on the willingness to donate. Brazil is promoting May 19 as World Human Milk Donation Day. “On that day in 2005, the first agreement to create an international network of milk banks was signed by 13 countries and international organisations,” said Almeida. In Rio de Janeiro, the Fernandes Figueira National Institute for Women, Children and Adolescent Health (IFF) is the Fiocruz unit specialising in neonatal care and milk reception. Rosane Xavier, a 35-year-old nurse who works in the IFF prenatal laboratory, encourages mothers to breastfeed and, if possible, to donate milk. Xavier nurses her first son, aged two years and two months, and she is a donor. “When milk is plentiful, I invite mothers to donate. One must be aware of the importance of breast milk for children, and especially for premature babies,” she told IPS. She says donating breast milk, an intensely personal act, benefits both parties. The advantage to the nursing mother is the removal of excess milk, which can cause problems if it accumulates. And the baby receiving the milk is likely to have fewer illnesses and improved growth. South Africa is having parallel development of low tech milk banking and we look forward to such impressive results and thorough coverage as seen in Brazil. Well done for their great efforts!